An official source at the Tajik Ministry of Transportation declared the repair-and-renewal operations have been launched after soil has subsided in some parts of the tunnel following the quakes that hit the area last month. “The repair-and-renewal operations are being carried out by specialists of China Road Company, which has built the Khatlon Tunnel”, the source said, noting that the repair-and-renewal operations are expected to be completed in early August. 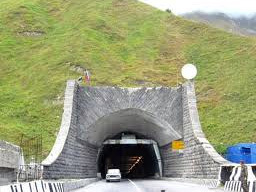 Currently, vehicles are running to Kulob and Khorog via the Chormaghzak Pass, under which the tunnel was built four years ago. The 4,430-km Khatlon Tunnel (former Chormaghzak Tunnel) , which is part of the Dushanbe-Vahdat-Danghara highway construction project, has been has been dug under the Chormaghzak Pass, which is located some 35-40 km southeast of Dushanbe. The estimated budget for construction of the tunnel is some $70 mln. It was commissioned in October 2013.